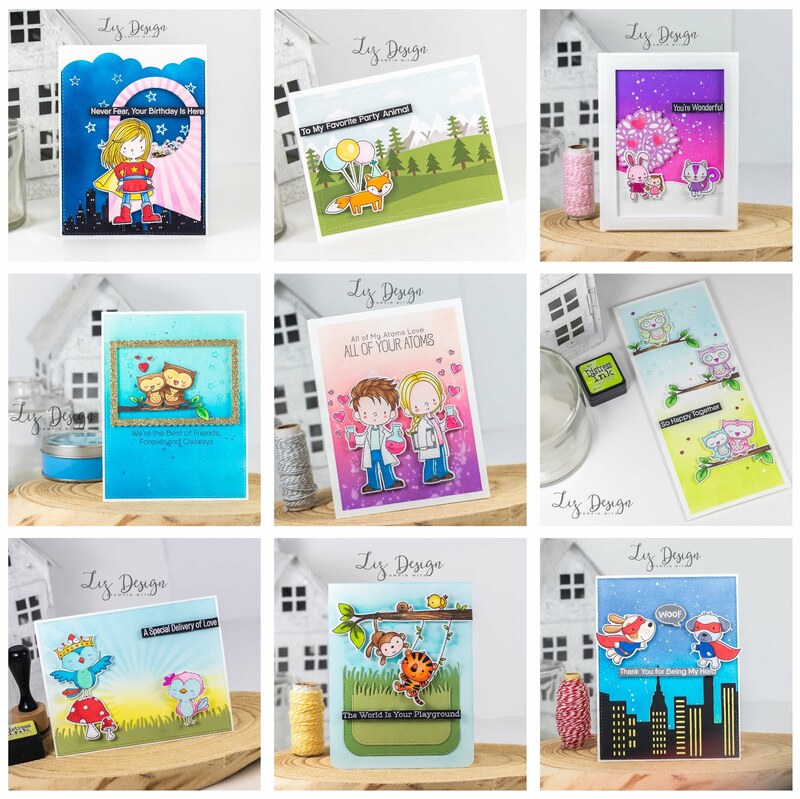 Welcome today at the Stampstories Blog Hop! This will be my first hop with these incredible ladies, so glad to be part of this team! Today we are going to show you some amazing projects on which we used Watercolor techniques! Make sure to check out all the amazing projects! You can check the other blogs by using the links that will be at the end of this post. I created a fun card with the So Hoppy Together stamp set. I stamped all three frogs that you will find in this fun set. For the middle frog I only stamped the frog, not his cute bike, by using a piece of masking tape to make sure, the bike wouldn't make it to my paper. After stamping, I diecutted these fun guys so I could place them with dimensionals on to my finished card. I used a piece of Thick Whisper White as a cardbase for my card. For the front panel I used a piece of watercolor paper on which I added Bermuda Bay ink. I used a fun technique to create my background, just by using a piece of plastic and ink. You can find a video tutorial here for this technique which I used for a previous card. To create the waterdrops, just don't slide the plastic but use a bit of pressure on your plastic to bring the ink on to your paper. To finish this card I added some spatters in Night of Navy ink and embossed text on Basic Black cardstock. Thanks Emma! Feel the same here! 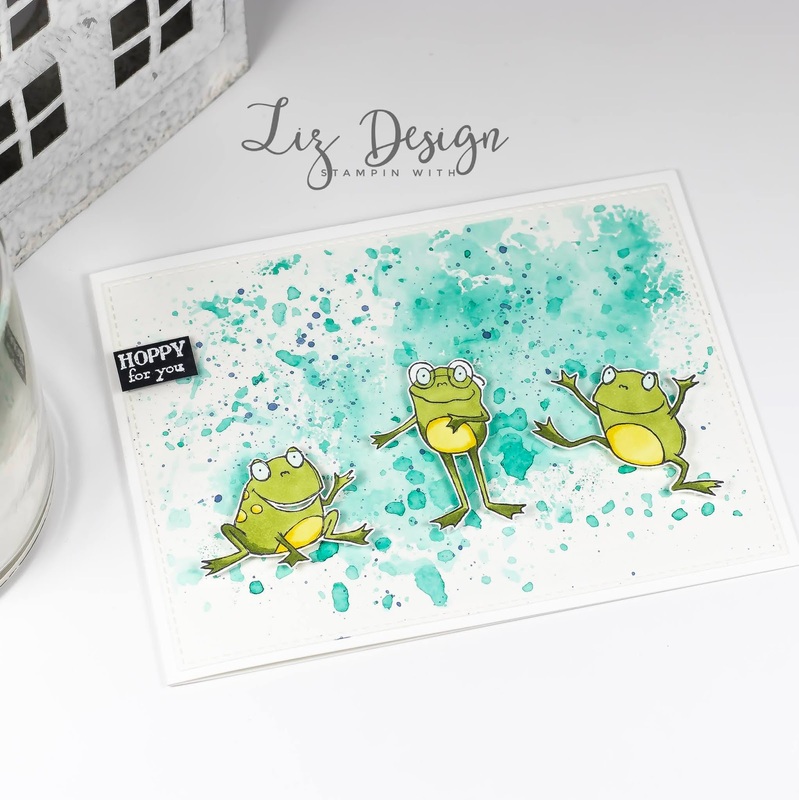 Liz, these frogs give a smile! We think they are in the day pool with friends! And the bottom is so bright (I love Bermuda Bay). I'm so happy to jump with you this year! 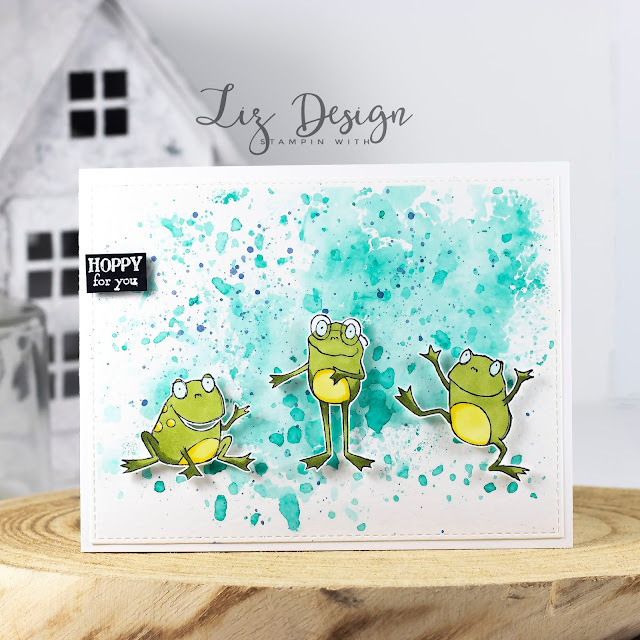 Stampin with Liz Design: Happy Hippos Card! Stampin with Liz Design: So Much Love Card! Stampin with Liz Design: Sweet Somebunny Card! 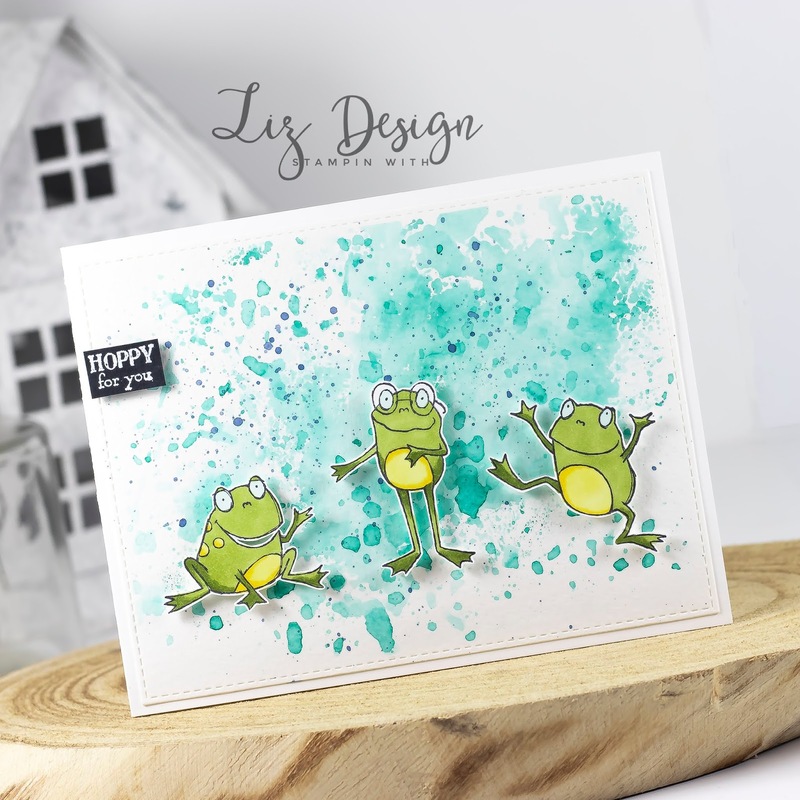 Stampin with Liz Design: Cutieasaurus Card! 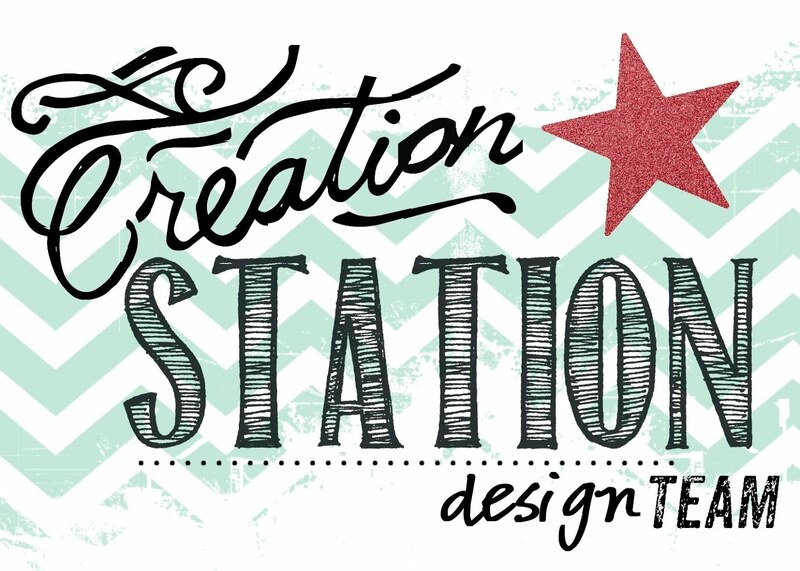 Stampin with Liz Design: Tweet Friends Card! 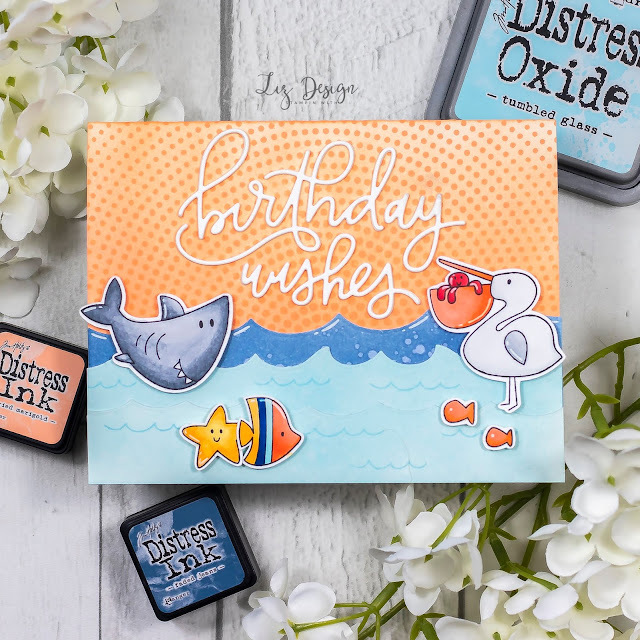 Stampin with Liz Design: Cute Chemistst Card! Stampin with Liz Design: On Thin Ice Card!